Pressure sealing, the latest version of self-mailers, has emerged as an efficient alternative to folding and inserting. Pressure seal mailers are laser-printable forms with a pre-applied cohesive glue line around the form’s edges. Once the form is folded, the glue patterns line up on all sides, and the form is sealed by pressure. This creates a folded document sealed on four sides that’s ready to mail without an envelope conforming to U.S. Postal Service regulations. 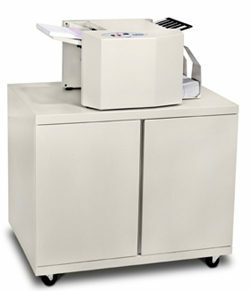 Companies looking for a fast, reliable, low-cost alternative are opting for pressure seal, which is ideal for a broad range of applications such as checks for payroll, accounts payable, refunds, tax forms such as 1099s and W-2s, appointment notices, packing slips, class schedules, lab reports, statements and invoices. Pressure seal forms are available in a generic blank format or preprinted. They’re available in cut sheet, continuous fan-folded, or as 50-inch rolls to easily adapt to various processing systems. They can incorporate bar codes, integrated cards or labels, and include a registered-mail format. Advantages of pressure seal mailers include stretching budget dollars by eliminating envelopes and storage costs, and maximizing postal discounts by printing postal net bar codes directly on the piece. Also, not utilizing a window envelope reduces problems associated with documents shifting within an envelope and limits readability concerns. The direct-to-mail pressure seal approach also lends itself to simplified sequencing for mail preparation and sorting. It’s time to revisit 1-piece mailers. They’re a superb solution for customers who want a more streamlined and productive solution, and a safe, secure way to mail. Impressive Layout, is it selfmade?